This interactive presentation contains the latest oil & gas production data from 66689 horizontal wells in 8 US states, through October. Ohio production through September is included, but deselected in most views. Cumulative oil production from these wells reached 6.08 Gbo, while cumulative gas production topped 50.3 TCF. October oil production showed the first increase in 2016, as a major rise in North Dakota more than compensated an overall small decline in the other basins (before revisions). Almost 1/3rd of production in October came from wells that started in 2016. Gas production declined, and was in October at a similar level as at the end of 2014. The “Well quality” tab gives an overview of how the production profiles of all these wells has changed over the years. I’ve selected the major oil basins here, and as you see, the average horizontal well that started in 2016 did again a little better in initial production, but follows a similar production profile as earlier wells. This is the result of different trends in these basins, as I’ve shown in the individual posts. Of note is also that through October 2016, just half the number of wells were started (3780), compared with a year earlier (7418). We can see in the last tab (“Top operators”) that part of the growth in oil production in October came from EOG and Continental Resources. This “Ultimate recovery” overview provides another view on how production profiles have changed over the past few years. The thickness of the curves in an indication for the number of wells that started in that period. The major oil basins are selected, using the “Basin” selection. Production profiles appear to be quite predictable, on average, so this should help in figuring out a likely range of ultimate oil (or gas) recovery. Using the “Operator (current)” selection at the bottom, you can see how different operators are faring in this regard. If you’re interested in more recent developments, use the “Show wells by” selection at the top to select “Quarter (or month) of first flow”. 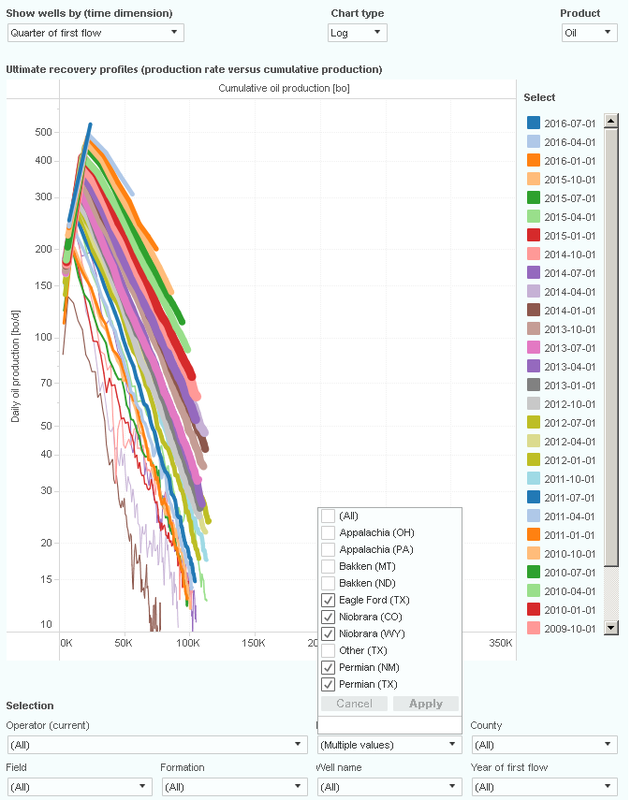 In the next tab (“Cumulative production ranking”), you can see the cumulative oil (and gas) production for all operators, and where their wells are located. Just click on a name to see the details. The 3rd tab (“Well status map”) is helpful if you would like to know the location of wells, based on their status; e.g. where new wells started production, or where the DUCs are located. Note that for Texas certain well statuses are not available. Next week I will post another update on North Dakota, followed by a new “Projections” post. This image shows for the oil basins outside the Bakken, the clear relationship between cumulative production, and production rate, over the full range of production rates. The oil and gas production separates quite obviously, especially in Bakken — GOR could increase more than 50% as production goes on, and the 2nd slow decline is much more obvious for Bakken. As the oil and gas production science tells us this is due to the fact that these tight reservoirs has no way to keep its pressure as soon as the production starts. As the pressure starts to drop, one sees the dissolved gas and oil separates, and because gas has higher permeability, they come out of nano pores first leaving oil behind and never able to come out again. I wonder if slowing the production could slow down the pressure drop, so it might extend the higher oil cut production portion longer? I wonder if your website could separately analyze the wells has slower decline, say wells with with 1st year decline less than 30% or 35% versus the rest, and see if the oil cut is also higher? This might work differently for different basins, because I see EF has almost the same fast decline for oil and gas. Also, I read shale gas wells already practicing such fixed production for some wells in hope to slow down the collapse of pores and fractures. Some claim that the fixed production model could help getting larger production. But, obviously this is not widely practiced. I wonder why not? Since using lower than highest IP as fixed production could enable the E&P companies to control the supply side, thus have better economics? S0me E&P companies are doing fixed production only for wells with exra-ordinary IP so they dont have to choke their pipelines. Interesting questions, that I hope others may have something to say about. > I wonder if your website could separately analyze the wells has slower decline, say wells with with 1st year decline less than 30% or 35% versus the rest, and see if the oil cut is also higher? Currently it is indeed not possible to select wells based on their (e.g. first year) decline rate. That may be an interesting idea for a future improvement, but I’ve not planned this for the near term. But, as you can select individual wells, or fields, with a bit of manual work you may be able to spot certain locations where decline rates are high or low, relative to their basin. Then you would only need to switch the product selection between oil & gas, to see if these decline rates appear to have a correlation with how GOR develops as well. This approach would be more cumbersome for larger samples though. The first derivative ∂logq/∂Np versus time for each period would be a fascinating relationship to study. The key reason behind the singular decline rate of shale or tight oil is that water pumping to keep up the pressure in conventional oil is no longer available. Also other EOR methods are also not available for shale oil. In terms of IP, today’s conventional oil wells fares even worse than unconventional wells. @ Sheng Wu… you might want to clarify that statement by what “conventional wells” you are referring to, and where…. there are many areas that perform better, admittedly outside the US onshore in general. And doesn’t it stand to reason that the IP’s would be better? Given decline rates, they wouldn’t be able to compete with horizontals and large scale fraccing. An interesting question is to what extent can similar technologies be applied to more conventional formations across the world? you are right that I need to be more specific, Greasy Wheel. I meant for conventional wells onshore (US and many other places) now adays, not offshore, arctic or middle east. Why is Oklahoma production not part of this? I would very much like to add Oklahoma to this. It represents the largest part of the shale oil & gas from horizontal wells, that is still missing from the overviews here. However, I haven’t found reliable, freely available oil & gas production data for individual wells in Oklahoma, which I could republish. If there are such sources, I would be happy to hear about it. http://www.occeweb.com/og/ogdatafiles2.htm I believe you can find the information any information you need here. Thank you so much for supporting me on this. I welcome any help I get on trying to add Oklahoma production data. I’ve looked a few times in the past at this link, and encountered some issues. There is a lot of data there, but it appears that production data is only given in MCF, and that the liquids component is not provided. For example, Continental Resources has listed the Poteet wells in its presentations, and has shown that they produce both a significant amount of gas & oil. However, looking at the “2015prodn.txt” (in the “historical.zip”), only gas production is listed. See the screenshot below. Without a way to interpret this production data more precisely, I consider it unusable. Have I missed something that may help with this? There is s great deal of activity going in in these areas (EOR in unconventionals) and applying horizontal drilling and massive frac’ing to conventional resources. Tiny Granite Oil has been successfully injecting field gas in their Alberta Bakken operations for a few years now. Crescent Point is using closeable sleeves in their completion designs as they continue to use waterflooding to enhance output from their lateral wells. They are planning to implement this in North Dakota in the future. EOG is expanding their gas injection project in the Eagle Ford for EOR purposes. EOG recently applied for permits from North Dakota to attempt pilot water flood in the Bakken. In a related, yet more controversial vein, Bruce Oksol has been chronicling for years on his Themilliondollarway website, a phenomena he terms the ‘halo effect’. Essentially, he posts numerous wells’ results that show temporary (6/8 months) increase in output after nearby wells have been frac’d. This ‘hydraulic communication boosting offset production’ has been publicly noted as far back as 2013 by the CEO of Kodiak. Vigorous research on CO2 based EOR from North Dakota’s EERC has shown some surprising results. Stephan Hawthorne has studies online which display very high oil mobility- along with reduced MMP – from Bakken samples (Upper/Middle/Lower ) when ethane is used as the injected agent. Regarding expansion into more conventional targets, there are efforts underway in both the Clinton Sandstone in Ohio and non Bakken formations in ND to horizontally drill and fracture these more permeable formations using somewhat similar processes as the ‘shale’ ones. thanks for your enlightenment, Coffeeguyzz! I did not see more reports on the reinjection EOR from EOG after their first report last June. From this perspective, unconventional resources is indeed still in its teenage, lots of room to grow. As always, absolutely fantastic work Enno! Those production charts clearly, concisely and succinctly lay out the situation at hand for shale. 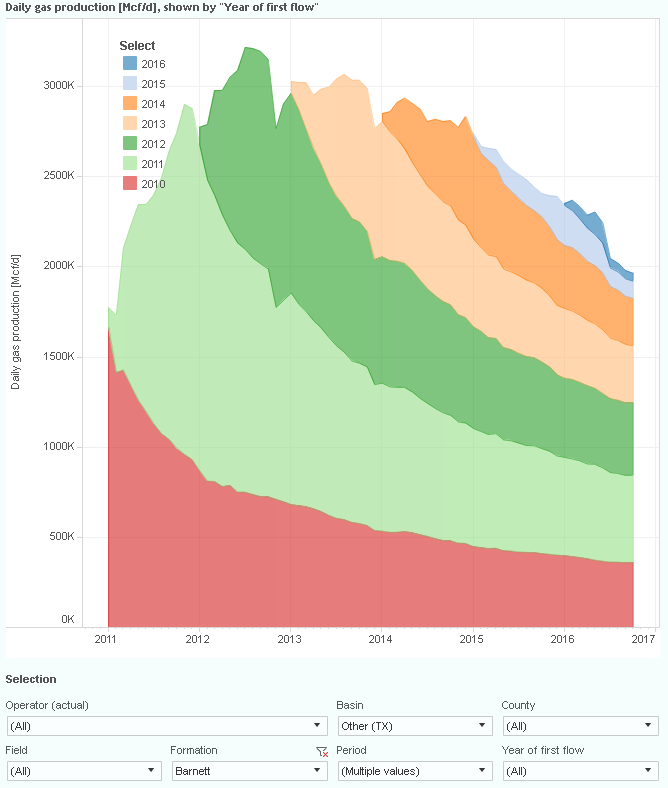 Unless something comes out of left field, I would dare suggest that peak shale has come and gone; it was clearly in the rearview mirror since March 2015. Funny how I haven’t seen any reports of this in Bloomberg, Financial Times or the Economist where such information needs to be presented post haste! Awesome to hear your feedback Mike, thank you! Thanks to Enno’s great work, we are beginning to get our arms around “Maintenance Capital” or the cost per barrel of oil produced to achieve a certain growth rate. 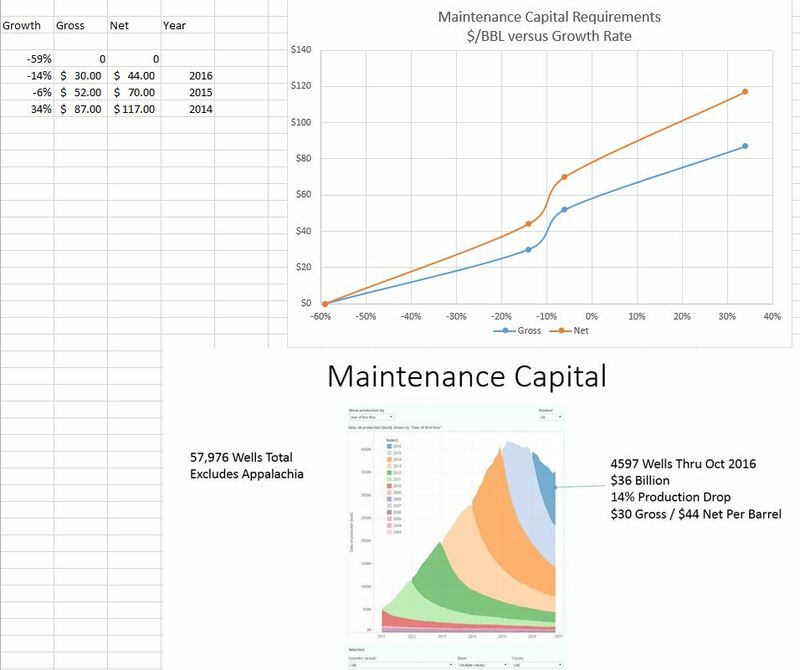 Take the number of wells completed during a year, estimate a capital cost. Divide it by the barrels produced for the Gross $/bbl. To calculate the net, take the Gross number and divide it by 0.8 to account for the royalty share and multiply by 1.08 or so for local taxes. Here’s what I get. At x=0, y= $80. In general you can see how the operators has improve the quality of completions (basically fractures) over the time, but not necessarily increasing the contact area but the permeability of the fracture system. The benefits are clear, the income arrive earlier and the business improve. the contact area it is no bigger because it should be another well close to previous and the same repeats ever a ever. it is like extracting more in small areas, faster. That is precisely what has been taking place. More effective use of diverting agents, coupled with the massive increase in proppant (especially #100 mesh), has enabled the early increase in production from unconventional wells. Looking at the operations during the time frame 2010 to, say 2014, may not be an accurate metric on this unconventional arena going forward. Improvements in drilling time, accuracy for staying within targeted zone, longer laterals (20,000 foot plus will be more common in the AB in the future), way more stages containing way more clusters (stress shadowing being overcome via diversion), seismic providing optimal entry points, and on and on. This so called ‘shale revolution’ and some of us commenting upon it, have been dismissed by many. The early financials, prompted by a plunge in oil/gas to a feaction of its early value, have led many to an erroneous conclusion that all this is short lived. 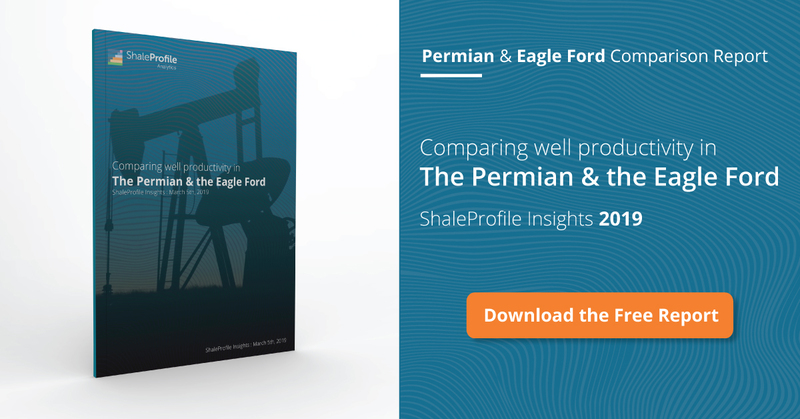 The tens of billions being invested in the Permian alone by the most well recognized companies in the industry should prompt a discerning observer to consider their presently held views. Does “Texas Other” classification include the Barnett and Haynesville horizontal wells? Would any other Basin be included? The “Well status map” offers nice functionality to quickly show where wells are located in a certain area. E.g. By only selecting basin “Texas (Other)”, you’ll see this. Note that this also clearly marks the Granite Wash play. By clicking on the blobs on the map, you’ll get tooltips with more information, such as formation & well counts. Thank you Enno. Your explanation helps greatly. This screenshot shows gas production in the Barnett. I got here by following the 3 steps outlined above (select “Texas (Other)” basin, “Barnett” formation, and product “Gas”), in the “Total production” overview. – Other, other TRRC districts, so including the Barnett & Texas Haynesville areas. These cover all horizontal wells in Texas, since 2010. If you select basin “Other (TX)”, and then formation “Barnett”, you will see these. They produce mostly gas, so make sure you select Gas as the product as well. It appears to me that the TRRC hasn’t allocated all these wells to specific Haynesville field (incl. formation) codes. Therefore, there is no Haynesville formation available. I recommend to locate these wells by using the County filter, to zoom into the right area. Then, maybe you can try looking at the formation & field filters to see if you can narrow the selection further down. I realize that this isn’t so convenient yet. Now that you updated the Permian yesterday, when will you update the US through November?